Android is the best platform to find a massive range of games. There are many genres to choose from. One such interesting category of games are adventure games. These games are often fit into one genre or are sometimes under many genres at once. All an adventure game really needs is to take you on an adventure. Here’s one that will take you on an exciting Viking journey - Nine Worlds - A Viking saga. 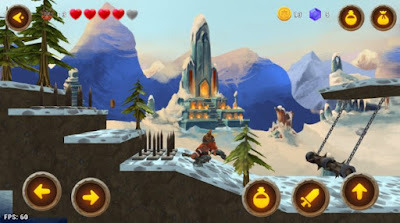 It is a unique, challenging and fun adventure platform game for all Android users that want to immerse themselves in a Viking saga. The game is designed with neat user interface, beautiful HD graphics, dozens of features and characters that improve the gameplay and a great story behind it all. In this game you play as the hero that saves the nine worlds of what’s bringing them to chaos. The story starts with a ship that’s going home from a successful Viking raid, when suddenly it gets caught in a terrible storm. The ship starts sinking, taking your brothers and all the treasure with it. You are the only survivor who has to find out who is corrupting the nine worlds and help the mysterious fairy Ozma bring balance back to the nine worlds. Become the ultimate hero by jumping, chopping, spinning and stabbing monsters and enemies, avoid traps on your way and don’t forget to collect coins, valuable items and gems. Fight with your hands and powerful weapons, discover the hidden treasure rooms and win awesome achievements and rewards by completing daily side quests. 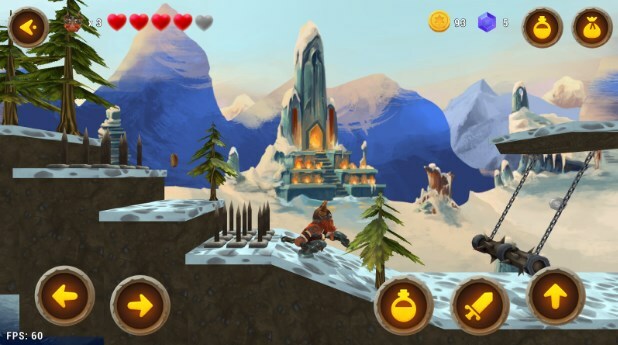 Play through challenging levels, compete with other players and enjoy this one of a kind adventure by downloading it from the Google Play Store – it is totally free!